That moment, transformative in more ways than one, follows in the wake of numerous successes represented by shows distributed over the Internet, including Netflix’s House of Cards and Orange Is the New Black. (Netflix also recently debuted Unbreakable Kimmy Schmidt, a Tina Fey–created comedy originally slated for NBC.) Even live sports, cable’s best hope for retaining subscribers, can be viewed online via services like MLB.tv (although blackouts still exist) or, for soccer fans, FirstRowSports. The NFL’s as-yet-unnamed foray into online streaming will test the waters with an October 25 game only available online. The cable and telecom industry has taken note, evidenced by its heavy lobbying against net neutrality, or the concept that Internet service providers should support equal access to all content and applications (such as data-heavy files of online video) regardless of the source or how much bandwidth it requires. Instead, industry executives contend, consumers should pay depending on how much data they use—an argument that makes perfect sense to providers seeing an increase in demand for high-speed broadband service and slowly but steadily declining numbers on the cable side of the equation (overall subscriptions dropped by 190,000 in the final quarter of last year). While the battle between the FCC and broadband industry continues to play out, consumers, as usual, are doing their own thing. According to an October 2014 comScore survey, 24 percent of millennials do not subscribe to a pay-TV package at all (13 percent were cord-cutters, 11 percent were “cord-nevers”); in addition, one-third of millennials reported watching a TV show on their smartphone within the last month. That trend is fostering a next generation of entrepreneurs developing new revenue models that aren’t built around the traditional program formats, a shift that writers and producers are taking full advantage of by creating shorter (more smartphone-friendly) shows on topics that many advertisers would find too edgy. How we consume TV, it seems, is changing what we consume, opening up new opportunities on the business and creative sides of an industry that hasn’t seen a similar degree of change since pay TV’s introduction in the 1970s. Netflix, Hulu, and Amazon are the established players in this new frontier—but the number of upstart media companies vying for viewers means that the landscape could look completely different down the road. “It’s a gold rush,” says HBS senior lecturer Henry McGee, who until January 2013 served as president of HBO Home Entertainment, the network’s DVD and digital distribution division. “The most exciting thing about this area is waking up and knowing that whatever you thought was true yesterday is not true today.” In April the company, after some deliberation, launched HBO Now, a standalone digital product that allows viewers to watch new (and archived) HBO content without a cable subscription for a monthly fee of $14.99. Consider YouTube sensations Bethany Mota, GloZell Green, and Hank Green, all of whom started out making low-tech videos in their bedrooms. President Barack Obama sat down for interviews with each of them, streamed live to YouTube, a couple of days after his State of the Union address in January. YouTube is the biggest, most visible platform for this shorter-form, nontraditional content, but other multichannel networks are springing up to offer a differentiated experience to win viewers. Jason Kilar (MBA 1997) stepped down as CEO of Hulu in early 2013 to head up Vessel, a service that offers subscribers early access to new content from YouTube and more mainstream celebrities for a monthly fee of $2.99. (Subscribers can view online original content such as Alec Baldwin’s Love Ride or the latest videos from “next generation” creators including beauty and fashion guru Ingrid Nilsen and comedic “internetainers” Rhett & Link, in addition to offerings from A&E and Major League Soccer.) When describing the current potential for online video, Kilar cites the early days of pay TV and its flowering, many years later, in big-budget epics like HBO’s Game of Thrones. Kilar says that he cofounded Vessel, which launched in March with backing from Jeff Bezos, Greylock Partners, and others, to address a problem: While a number of video creators were building a passionate following, very few had managed to build sustainable businesses on that success, a fact that Kilar attributes to the free, ad-supported distribution model used by online platforms such as YouTube. Vessel’s message to creators is clear: Give us a three-day head start on streaming your video and our hybrid subscription/advertising–based business model will generate significantly higher revenues for your work—more like $50 per 1,000 views vs. the $2 per 1,000 more typical of an ad-only model like YouTube’s. For entertainers with views in the hundreds of thousands, or even millions, that difference can really add up. At Vimeo, an open video sharing platform founded in 2004 by filmmakers Jake Lodwick and Zach Klein, creators gain more in revenues and control by using its Vimeo On Demand platform to sell content directly to audiences worldwide, reaching more than 170 million viewers each month. Creators pay a premium for its tiered service to have complete control over their content—including no disruptive advertising. As an example, Trainor cites High Maintenance, a Vimeo-produced web series created by husband-and-wife team Ben Sinclair and Katja Blichfeld that follows a nameless pot dealer (“The Guy”) as he delivers his wares by bicycle to various clients around New York City. Sinclair and Blichfeld won a 2015 Writers Guild Award in Short Form New Media for “Rachel,” an episode about a cross-dressing author with writer’s block. “They’re exploring themes that many advertisers might not be comfortable with, but they’re doing it for narrative, not shock value,” says Trainor of the critically acclaimed series. In addition to creative control, Sinclair and Blichfeld can reap the direct benefits of selling individual episodes (which range in length from about 5 to 20 minutes) for $1.99 each or a season of 13 new episodes for $7.99. Trainor adds that Vimeo is also becoming an appealing tool for more traditional distributors and movie studios, because the platform can make content available to stream on any device—smartphone, tablet, computer, connected television—anywhere in the world, in HD quality. “The fundamental shift in expectation that you can access any type of content, any time, on any screen is more or less established at this point,” he says. “The most important thing to remember about consumers is that they’re always reaching for the best available screen,” Kilar agrees. “Increasingly, it’s a smartphone. That is a very powerful trend we want to serve in a big way.” This year, just over half of the 204 million Americans who engage in digital video viewing will do so on their smartphone, a 14 percent increase over 2014 according to research firm eMarketer. Kilar ranks his own screen hierarchy as follows: smartphone, tablet, computer, television. “Traditional television can be a friction-filled experience,” he says. “Often you have to go to a certain room of the house at a certain time and find the right channel for your show—is it 723 or 694 on the cable dial? There is a long history of consumers pursuing the path of least friction.” Watching a five-minute video on your smartphone while waiting in line at the post office or riding the bus to school? No friction at all. This new reality has not gone unnoticed at traditional networks like the Disney/ABC Television Group, where Albert Cheng (MBA 1997) serves as EVP and chief product officer, digital media, overseeing 50 million downloads of ABC, Disney, and ABC Family content each month. 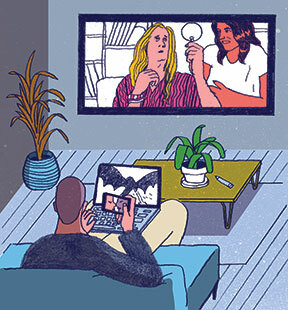 A sectionmate of Jason Kilar’s, Cheng can’t resist taunting his longtime friend by bringing up the fact that in 2006, ABC beat Hulu, Netflix, and others to the punch by being the first to offer online, on-demand video content. But he’s also quick to note that the evolution of shorter-form content such as that being offered by Vessel and Vimeo probably represents the biggest marketplace opportunity in the years ahead. “Traditional film and TV content formats grew out of the business distribution models from which they were born,” says Cheng, citing the convention of the 2-hour movie and 30-minute or 1-hour TV sitcom or drama. “Now we have the factor of a mobile phone and a shorter format.” The question then turns on the best format and advertising model to appeal to the growing demographic of millennials who use a mobile device as their main screen, he adds. This level of engagement has been noted by marketers, as consumers—particularly millennials—become more and more adept at tuning out traditional advertising in favor of what they consider to be more authentic experiences. As a partner and managing director at BCG Digital Ventures, Walter Delph (MBA 2003) works with companies to develop apps, connected devices, and online content—including video—that will engage customers on a level that goes beyond the straight sell. “When you provide meaningful services, experiences, and social engagement, then you have something that brings the consumer back on a weekly or even daily basis,” says Delph, citing Red Bull and GoPro as two examples of brands that have created direct relationships with consumers. Red Bull, for example, operates Media House as a standalone entity, producing content such as its Red Bulletin lifestyle magazine and feature-length films focusing on skiing, snowboarding, and motorcycle racing—just the sort of exploits favored by Red Bull’s young, mainly male audience. Yes, the energy drink’s iconic logo can be spotted on the helmet of Norwegian downhill skier Aksel Lund Svindal in the movie Streif—One Hell of a Ride. But no mention is ever made of the beverage’s restorative properties. Does Svindal drink Red Bull? We don’t know, and it doesn’t matter—he is too busy flying by at 80 mph, being totally awesome. At the very least, the film boosts Red Bull’s brand awareness—and in the meantime, it can sell tickets in Austrian and German movie theaters and downloads on iTunes. The search for the real deal is cited as one of the factors driving the startling results of a Variety survey last year that asked 1,500 Americans ages 13-18 to rank 20 media personalities in approachability, authenticity, and other criteria that were considered aspects of their overall influence. The top 5—and 6 of the top 10—were YouTube stars, outranking household names such as Jennifer Lawrence, Katy Perry, and Johnny Depp. According to survey comments, teens responded better to the less filtered, more candid style of YouTubers versus the polished personas of Hollywood celebrities. 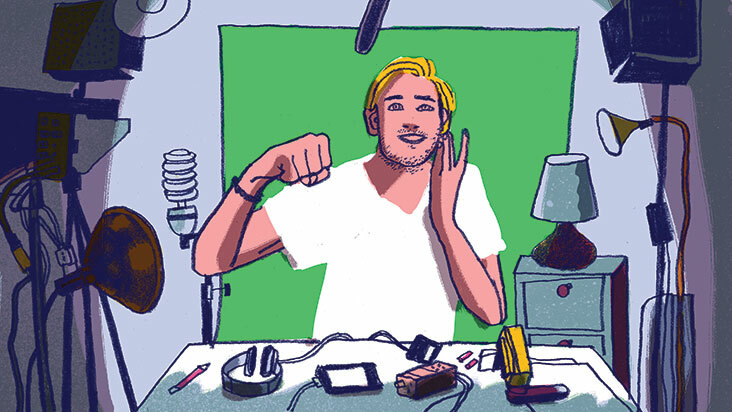 Further evidence of a changing of the guard was seen last year, when Disney, one of the oldest of the old-line media companies, forked over nearly $500 million to acquire Maker Studios, a multichannel network that attracts more than 11 billion monthly views across its 55,000 YouTube channels (its stable of stars includes PewDiePie, a 25-year-old Swedish video gamer with YouTube’s highest number of subscribers). In 2013, DreamWorks Animation acquired AwesomenessTV (with Hearst jumping in for an $81 million stake last December); in March, Verizon announced it will partner with the duo that brought you Shrek and Cheerleaders New Jersey to launch an online video service that promises more than 200 hours of original content a year. Verizon competitor AT&T has its own entry in the online streaming field with Otter Media, a joint venture with the Chernin Group. And industry observers agree that more acquisitions and partnerships in the years ahead will only accelerate the pace of change in a tech-heavy business that still, at its core, is driven by the age-old power of storytelling. “The emotional bond that people have with content is so rich and so lasting that it feels like something more than a consumer product,” says Delph. “Sharing that experience with consumers creates a stickiness to the business that adds up to a bit more than just selling widgets,” he adds, expressing an opinion that holds whether the glow of the platform delivery system comes from a ghost-story campfire, a good old-fashioned TV, or a smartphone screen.